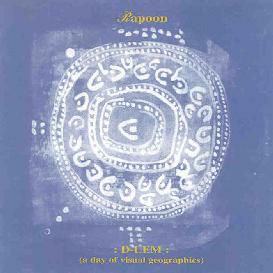 Rapoon - "D-Lem: A Day Of Visual Geographics"
Rapoon is a project by UK musician Robin Storey. This was recorded during the LEM Festival in Barcelona on 06-04-99 and produced by Grácia Territori Sonor. The CD consists of one long 54 minute soundscape. The soundscape starts off with some synthesizer drones and horns, which slowly melt out into a highly effected sample (sounds like it was voices?) and again a new synth drone starts, but more spaced out. A bit more than half way through some sense of a rhythm via a background percussion makes the piece more active. The last several minutes of the piece are quite eerie with some voices and chanting. Some of this stuff reminds me of the Aeon CD by Laszlo Hortobaygi from Hungary. An interesting musical experiment. For more information you can visit the Gracia Territori Sonor web site at: http://www.gracia-territori.com/. Contact via snail mail c/o Robin Story; 22 Elsdon Road; Gosforth; Newcastle upon Tyne; NE3 1HY; England.